We are proud to offer the brilliant Indian Fire Bowl Set 90cm Bowl Grill Stand Kadai Style Bowl Fire Pit. With so many on offer these days, it is good to have a name you can recognise. 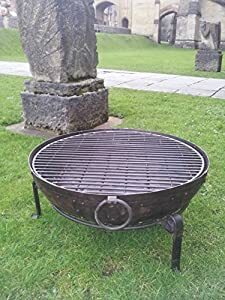 The Indian Fire Bowl Set 90cm Bowl Grill Stand Kadai Style Bowl Fire Pit is certainly that and will be a perfect acquisition. 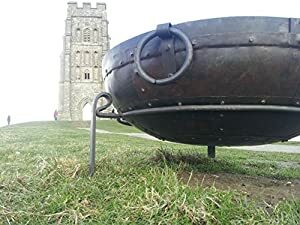 For this great price, the Indian Fire Bowl Set 90cm Bowl Grill Stand Kadai Style Bowl Fire Pit comes highly recommended and is a popular choice for lots of people. Red Apple (South West) Limited have provided some excellent touches and this results in good value. 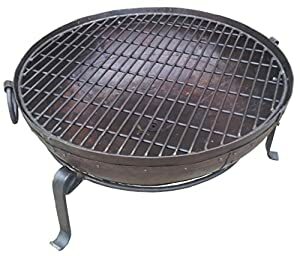 The Fire Bowl Set comes complete with stand and grill. 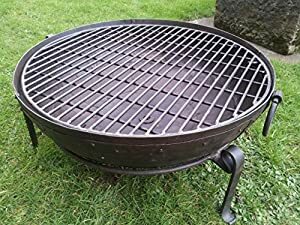 It can be used simply as a fire pit or, with the grill placed on the bowl, as a barbecue. Each bowl is hand crafted from recycled steel sections - each hand riveted together. The bowl sits on the robust wrought iron stand and has a removable grill. The bowls are styled on the large cooking (kadai / karahi) bowls used in ceremonies and for cooking 'street food' in India. 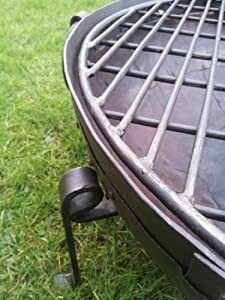 Features include:- Removable Grill, Wrought Iron Stand, Hand Riveted Seams, Two Carry Handles, Robust, Durable Construction, Quick Delivery From Wiltshire. The Fire Bowl, Grill and Stand are quickly dispatched by courier (UK 48 hrs, Europe 4-5 days). When you use the bowl we suggest you put 1 or 2 inches of sand in the bottom - put a small piece of broken pottery over the drain hole. We suggest you only burn wood or charcoal and leave the ash in the bowl between use. After lighting the bowl for the first time the light wax coating will burn off. Remember the bowl stand and grill will stay hot for a while after the fire has gone out. 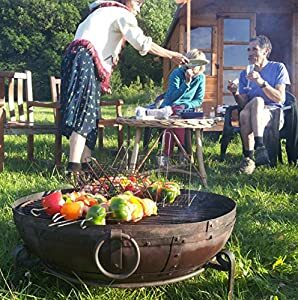 Enjoy your fire bowl - winter and summer. Thank you for shopping with us - any questions just ask us. After purchase we will ask for a phone number for the courier. Thank you. UK Fire Bowls +44(0)7805 249487. Any questions just ask.